When the word “ceramics” is mentioned, what most people imagine would likely be ornate traditional household objects and tableware. Any association with, or notion of, contemporary art might just be furthest from what one’s mind may typically conjure. Until, of course, they become acquainted with the clay and ceramics artworks by Umibaizurah Mahir @ Ismail, or Umi for short. Seeing her work, the idea that Umi pushes the traditional boundaries of ceramics would be an understatement. 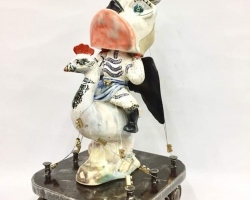 Over the many years that she has been active, ceramics has successfully been used as a medium to address and tackle many contemporary issues, occurring both domestically and globally. Among them are unfettered development at the expense of the environment, the state of the nation, and humanity through the lenses of economics and politics. 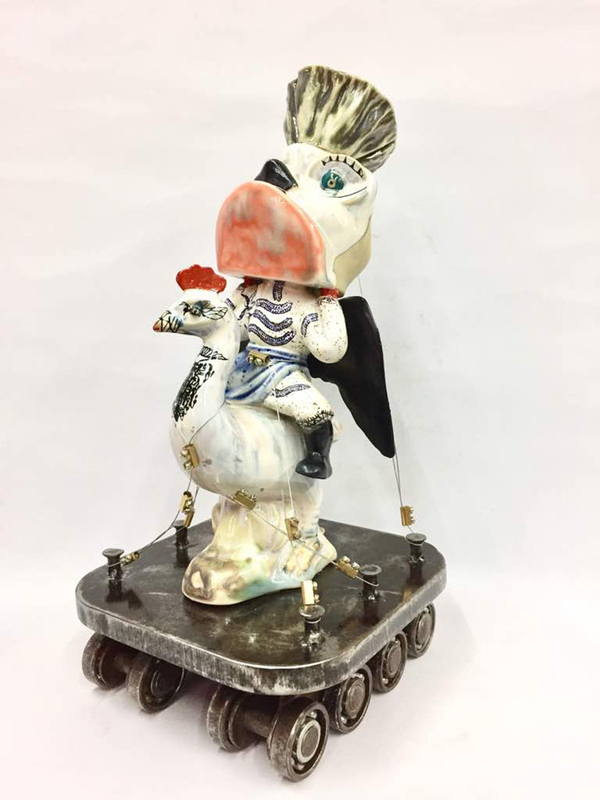 The seriousness of her subject matter is camouflaged by the playful visual quality of her ceramic sculptures and assemblages. 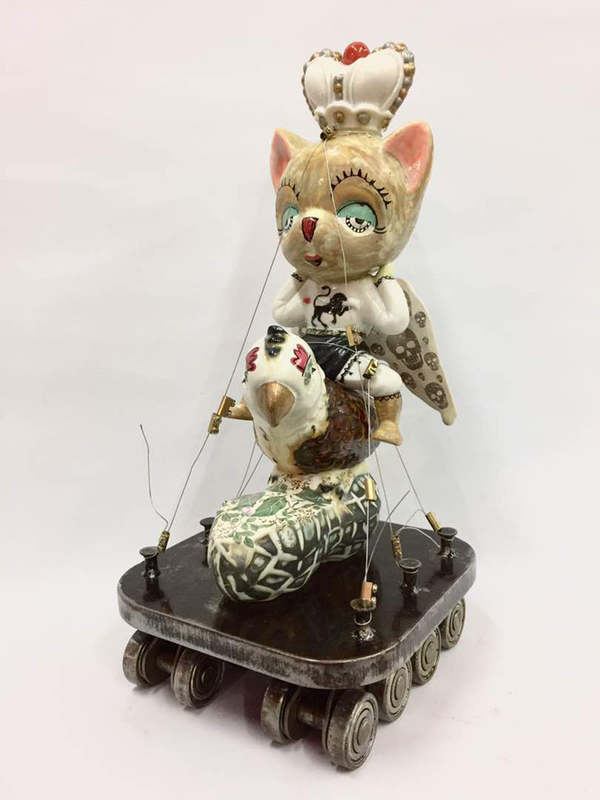 Many of her works are imagined hybrids of species, objects and machinery, linking the multitude of issues concerning the modern world we live in. 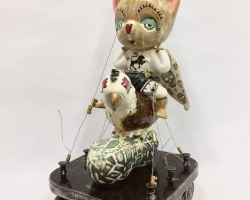 As sublimely toy-like as they may appear, these works of contemporary art are certainly not items for child play, but instead are deeply rooted in meaning and aesthetic, as can be surmised from the intricate surface imagery each objet d’art possesses. I regard clay as a form of vehicle for communication between religion, people, and across the cultures. For me, it provides a means for constantly evaluating our place in our time. Bye Bye 2016, Musee Maenaka, Miyagi, Japan. Tomorrow’s Land (3-Man Show), Pace Gallery, Petaling Jaya, Malaysia. The Opening, Art Cube Gallery, Kuala Lumpur, Malaysia..
5 Seasons, Norbert Dabekaussen Kunst Gallery, Sittard, Netherland. Century of The East, Silpakorn University, Thailand. TIANG SERI (Two-Man Show), Ernst & Young, Singapore. Art Invitational, Bank Negara Malaysia, Kuala Lumpur, Malaysia. Tabik/Salute (A tribute Exhibition for Jeri Azhari), National Art Gallery, Kuala Lumpur, Malaysia. 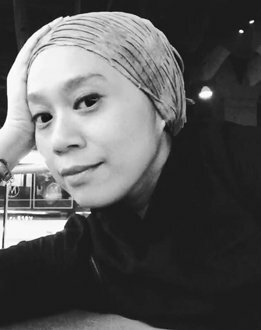 Wahana (Collaboration Exhibition, Singapore and Malaysia), National Art Gallery, Kuala Lumpur, Malaysia. Virus (joint exhibition with Ahmad Shukri Mohamed), Art Season Gallery, Singapore. Impressions, Shah Alam Gallery, Selangor. Malaysia.